Look & Feel Good Expo will make its debut in Durban at the Durban Exhibition Centre from 11-13 October, so Durbanites can now also browse and shop for the very latest in health and wellness products and advice showcasing everything you need to get fit, healthy, gorgeous and inspired. It’s time for the Look & Feel Good Expo, jam-packed full of fresh, innovative ideas and up-lifting products for a healthier, happier life that inspires the look and feel good factor! There’s no one size fits all when it comes to looking and feeling great. That’s why the Look & Feel Good Expo showcases health, wellness, fitness and beauty products; giving you more health and lifestyle products under one roof than you’ve ever seen before. The Look & Feel Good Expo is designed to help you find your healthy lifestyle fit. When you live a healthy life, you look better, work better and feel happier too. Come learn more at the Look & Feel Good Expo and experience the latest in fitness and nutrition, sample new trends in organic and whole food, and get a bit of pampering from top spas and makeover specialists. You’ll start looking and feeling better from the moment you set foot into the expo. Masterchef contestant Joani Mitchell will be demonstrating how to prepare delicious and wholesome meals at the Pouyoukas Look & Feel Good Kitchen. At the VIP Pamper Lounge, visitors who book the VIP package will receive red carpet treatment including Fleur de Lis Spa beauty treatments, revitalising refreshments and an ifeelgoody bag filled with goodies and gifts, courtesy of Fleur de Lis and Longevity magazine. Get a beautiful new look for summer in the Makeover Area or get your hair styled at the Cloud 9 Hair Zone. Watch would-be warriors in action or participate in the Trojan Warrior try-outs. Visit the Alternative Production Zone, where you will walk through display that will take you back to ‘old fashioned’ foods, their stories and health benefits. This attraction is a celebration of our agrodiversity and exploration of food and farming with compassion. Learn how to enrich your life at the Health & Wellness Workshops; Be Fit 4 Life Stage; Yoga & Pilates Studio and the Laughter & Happiness Workshops – where you’ll have the chance to meet Laughter Ambassador Shorty of Leon Schuster movie fame. Stock up on healthy goodies at the Natural & Organic market. Enjoy wholesome, health and Halaal foods at the Eatwise area. Eatwise is renowned for its strictly Halaal exotic Arab and Indian cuisine and delectable smoothies. Indulge your senses with fragrant, healing products and colour changing candles; discover effective natural skin and hair care solutions, subscribe to top health magazines, pick up a selection of healthy snacks, look into the new diet that everyone’s talking about and even find out how to enrol in pole dancing classes. Meet Lisa Raleigh, wellness expert and Look & Feel Good Expo’s Ambassador. Find out about becoming a certified personal trainer, learn about the health benefits of ozone and discover how holistic therapy can boost your body’s energy systems. Speak to all the experts on hand for the best health, wellness and fitness advice for you. Entry Cost: Adults – R60.00. 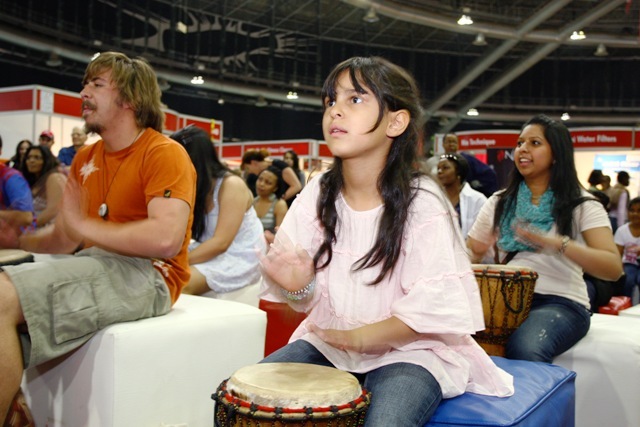 Seniors/Students – R 40: Children under 12 – Free. VIP Pamper Experience – R 250.00 each. Show times: Friday 11 October: 10:00 – 19:00; Saturday 12 October: 09:00 – 19:00; Sunday 13 October 09:00 – 16:00.